Bright, modern and much loved well maintained family holiday home in a sought after position, providing safe and easy access to Elie's long sandy beach through a private gate via the off street parking area to the front of the property, sea views from upper level, bright, fresh and contemporary decor with open plan living area. Sahara Park is situated within easy walking distance of shops, restaurants, pubs, water sports, tennis courts, golf course and all this very popular unspoilt seaside village has to offer. Just 20 minutes from St Andrews, ideal for golfers and families alike. 6 Sahara Park has 3 bedrooms (one of which is en-suite), family bathroom and extra w/c. A snug/playroom a useful addition for rainy days with tv/dvd player and a selection of books, dvds and games (there is also a double futon bed in here for occasional extra guests). The main living area on the ground floor is open plan, leading from which is access to a patio area with table / chairs and gas BBQ. Basic SKY TV channels and wi-fi provided. Well behaved dogs welcome (supplement applies). Entrance Hallway with storage space for golf clubs etc. To the rear of the house is a fairly spacious area of patio with table/chairs and a gas BBQ. Whilst this patio is at the end of the row please note it has not been sectioned off by fencing from the other patio areas behind adjoining houses, but is enclosed at each end. Just wanted to let you know we had a great time at 6 Sahara park, perfect location and really well kitted out accommodation. Would definitely return! Many Thanks. Thank you so much for allowing your beautiful house to be used for visitors. We're new to this coastline and thoroughly enjoyed exploring it. We normally holiday on the Moray Firth or Aviemore but this is so much closer to home ans yet a world away. If you'll let us stay again we'll be back with the dog the next time. We had a lovely time. The house was ideal for five of us and having the beach just round the corner was ideal for the dogs! We enjoyed some shopping in the village and a fantastic Christmas Eve meal at The Ship followed by Christmas morning service at the church. Otherwise it was mainly downtime apart from a couple of trips to St Andrews. Thanks so much for the friendly, helpful advice provided and making all the arrangements so easy and straightforward. We'd love to make a return trip so I'm sure I will be in touch! Thank you so much. We have had a lovely family Christmas and have enjoyed rediscovering the area and introducing new family members to it. We hope to return. All the best for 2017. Fantastic weekend break - love the house. Everything you could possibly need! We'll be back! Our second visit and won't be our last. Beautiful home in a wonderful location we love walking the coastal path. Love the beach and lovely sunsets. Seeing the stars on a clear night! Just some of the wonderful memories we will have. Thank you for sharing your home with us! Have had a wonderful weekend in this lovely house for mums 80th birthday. Weather fab too. Will be back. A wonderful holiday in a very lovely home. Brilliant location by the beach and great weather! We will be back. Thank you! We had a wonderful time at 6 Sahara Park. I am sorry, I had meant to email when we got home. The house was wonderful - such a fantastic location and beautifully furnished and decorated. Every little detail had been thought of and provided for. 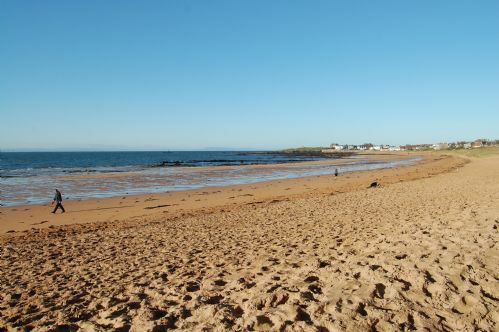 Elie is such a lovely place with the most amazing beach! The communication with your company was fabulous and the arrangements for arriving etc were very easy. We can't wait to come back. A very quiet comfortable home with all the necessary equipment for an easy life! I especially enjoyed the many pictures throughout the house. I can recommend this as an outstanding place to stay and will be doing so. I hope we will be able to stay another time. Had a wonderful week with friends, definitely be back!